Okay, he didn’t actually go to the moon, but his name is on it (figuratively speaking, of course)! “Banting” is the name of a crater on the moon, and has been since 1973. Banting’s crater is a bowl-shaped, “simple” crater – the smallest type of crater, their shape usually suggests that the gravitational collapse after impact was only minor; it is about five kilometers wide. The crater was named after Banting by the International Astronomical Union in 1973, after a significant change to the rules of naming craters. What used to be a very exclusive honour (reserved for ancient philosophers and deceased astronomical researchers), was opened up to deceased scientists of all fields, and even contributors to cultural knowledge, like writers, artists, and composers. It is also near the middle of the moon’s Mare Serenitatis, or Sea of Serenity. Originally thought to be water on the moon’s surface, maria (the plural of mare) are actually very flat spots on the moon, where past craters have been covered up by molten lava which cooled and left the area smooth. The Sea of Serenity is widely viewed as being the face many see in the moon’s right eye, so although it is small, Banting’s crater happens to be fairly front and centre. Fun fact: the Man in the Moon is always facing us, as he is on the near side of the moon. This side faces us all the time because the moon is on what is called a synchronous orbit, rotating once completely on each trip around the earth. The synchronous orbit began because the moon, with its oblong shape causing it to have a unique relationship with gravity, began to slow down from its original rotation rate. It has been locked into a synchronous orbit for billions of years, always turning the Man in the Moon, or the near side, to face earth. 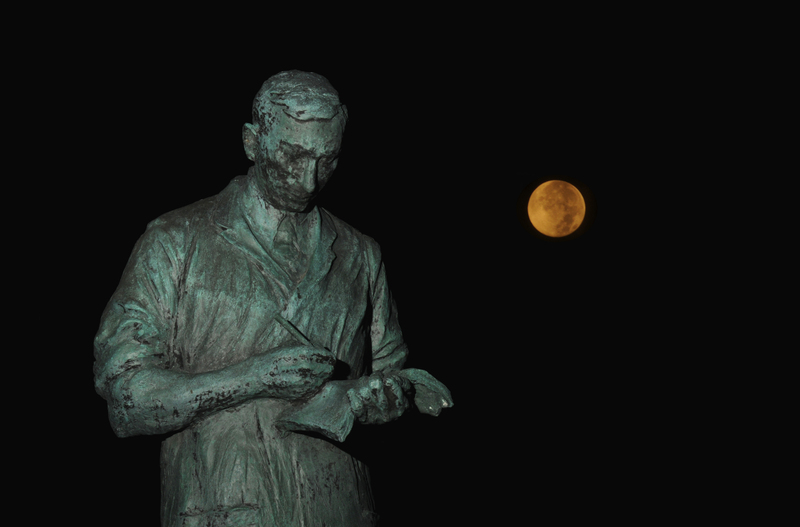 Banting is actually one of only four Canadians that have had craters on the near side of the moon named after them – the other three being Oswald Avery, Reginald Aldworth Daly, and Carlyle Smith Beals. There are six more craters on the far side of the moon, named after Canadians Jahn Plaskett, Frank Hogg, Clearence Chant, Robert Petrie, Andrew Mckellar, Simon Newcomb and John Foster. Posted in Behind the Scenes at Banting House.Tagged Astronomy, Banting, Crater, Interesting Facts, Moon, science.